Louise Ford FSET ATS, Education and Skills Tutor at Staffordshire-based PM Training has been awarded Advanced Teacher Status and become a Fellow of the Society for Education and Training; one of only 50 people across the UK to achieve the new status. 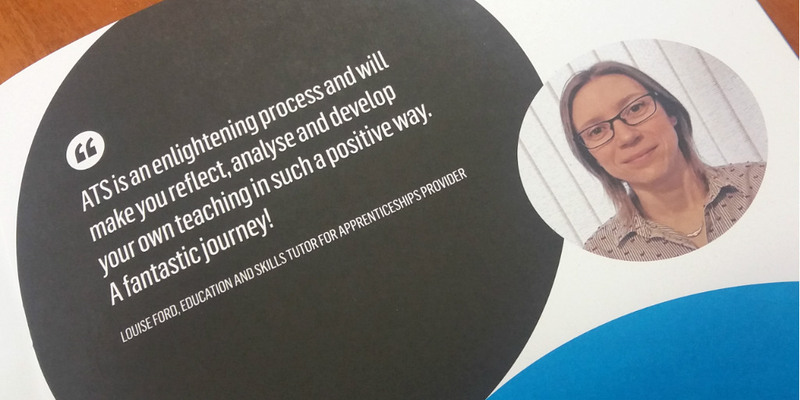 A tutor at PM Training for over 12 months and with experience in work-based learning for over twelve years in Maths, English and ICT; Louise talks to us about her journey to becoming an advanced teacher. What does it mean to achieve ATS (Advanced Teacher Status)? In my role as a lead tutor for apprenticeship provision, the new status has given me so much. It’s not just a regular teaching course as there are lots of other things I’ve had to do. I’ve been active in mentoring other staff members and delivering meetings. It’s allowed me to take a proactive approach to staff development and has put me in a better position to fulfil leadership responsibilities in a more influential capacity. What has been the biggest challenge over the past twelve months? My biggest challenge has been forcing myself to be organised throughout. There are so many elements to the course and so many meetings to arrange and attend, it has been essential to managing my time. I’ve had mentoring meetings every week for seven months alongside staff meetings, so I’ve been keeping my lists and post-it notes up to date. The status has made me look at what we’ve got at PM Training and be more confident in pushing the boundaries of teaching in a positive way. For example, I’m very passionate about using technology to enhance the learning experience for young people. The biggest achievement for me would be presenting my research at the 2018 LSRN (Learning and Skills Research Network) East Midlands Conference in front of fellow FE teachers and lecturers from independent training providers and colleges. My background is in science, so research is something I really enjoy. Completing my research was a personal goal that I set myself, so the conference, held in Nottingham, brought together the two passions that I have; research and teaching. What advice would you give to tutors and teachers looking at Advanced Teacher Status? I’m proud that it could open opportunities to mentor like-minded colleagues across PM Training and share my experience and knowledge, so I’d say go for it. On a personal level, it has opened doors and given me opportunities to progress my own career within PM Training and develop new skills. It has helped me to push the boundaries and has a direct impact on the organisation and how we develop our provision. I’m watching people grow and develop and achieve the goals that they have set. I get a lot of fulfilment out of mentoring and enriching the learners learning journey.